MANILA, Philippines - The first and only vice presidential debate dubbed as "PiliPinas Debates 2016" happens today, April 10, 2016 at the University of Santo Tomas (UST) Quadricentennial Pavilion gymnasium. CNN Philippines brings the livestream video of this event in relation to May 9 national elections. Organized by the Commission on Elections (Comelec), PiliPinas Debates 2016 for Vice Presidential bets is in partnership with the Kapisanan ng Broadkaster ng Pilipinas (KBP), CNN Philippines and Business Mirror. The debate will be broadcasted live on free television Channel 9, from 5:00 p.m. to 7:30 p.m. 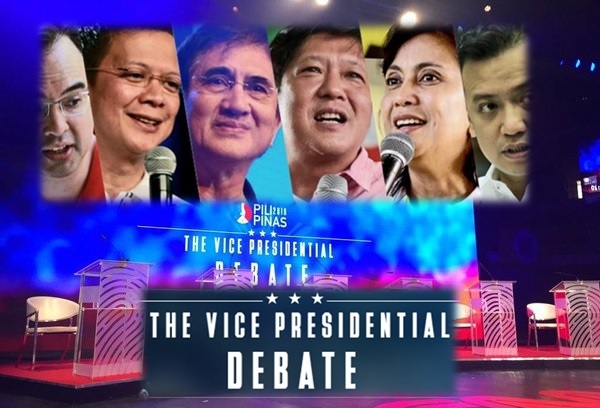 Note: The full video replay of vice presidential debate (courtesy of CNN Philippines) is now available on this page. Moderating the debate are veteran journalists Pia Hontiveros and Pinky Webb. Pre and post-debate programs scheduled at 4:00 and 7:30 PM, respectively will be anchored by Amelyn Veloso. On April 6, the Supreme Court has ordered Comelec Chairman Andres Bautista to allow the debates to be streamed "unaltered" on other websites other than the lead network but "subject to the copyright condition that the source is clearly indicated." SC Public Information Office chief and spokesman Thedore Te said that in a unanimous decision, the tribunal partially granted a petition filed by online news organization Rappler against Bautista. CNN Philippines vice president for News and Current Affairs Alfonso “Pal” Marquez III said all six candidates confirmed their attendance for the debate: Sen. Alan Peter Cayetano, Sen. Chiz Escudero, Sen. Gringo Honasan, Sen. Antonio Trillanes IV, Sen. Bongbong Marcos and Camarines Sur third district representative Leni Robredo. Unlike the previous debates, Marquez said that all vice presidential candidates will be given the opportunity to react on every question during the debate. "Hindi na kami nag draw lots kung sino yung candidate na magtatanungan. We’ll let it to our discretion to decide who will be pitted against whom," Marquez said to the media. "“Kasi kapag draw lots, let’s say yung dalawang kandidato they don’t differ in views, I tell you, there won’t be a debate. Kailangan yung merong conflict. So we will decide on the spot," he added. Comelec chairman Andres Bautista said the debate was patterned after the US Republican debates and in accordance with the international best practices and was properly agreed to by all the organizers. After the vice presidential debate today, Comelec will also mount the final presidential debate this April 24 to be organized by ABS-CBN as the lead network with Business Mirror as print media partner. This will be held at the University of Pangasinan. The successful run of first and second leg of the presidential debates were happened last February 21 (GMA-7) and March 20 (TV5).